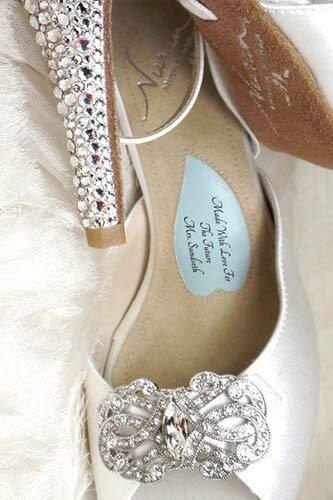 Truly beautiful, comfortable wedding shoes. It took a designer who is also a dancer to fulfill every woman’s fantasy. Shoes that feel as good as they look. Fabulous footwear that fits and functions well. 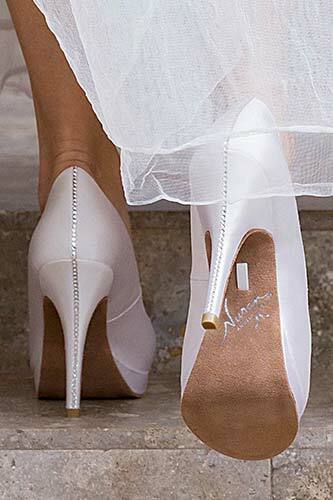 Angela Nuran Shoes are designed specifically as comfortable wedding shoes in off white silk to delight brides, yet are transformed into stunning special occasion shoes when dyed to match an evening gown. A silk clutch is the finishing touch. In a world where gorgeous shoes are just a click away, women are often disappointed that different brands of shoes they ordered turn out to fit poorly or hurt. Angela Nuran Shoes provide a superb, comfortable fit. Perfect shoes for a bride or mother, and only sold through retailers who personally help customers get exactly what they need. Just try them on. Nothing else compares. It started with a wedding dance teacher who saw women suffer wearing their designer shoes which were impossible to dance in and hurt too much to keep on their feet for very long. Angela set out to create the perfect special occasion shoes that could serve all women. 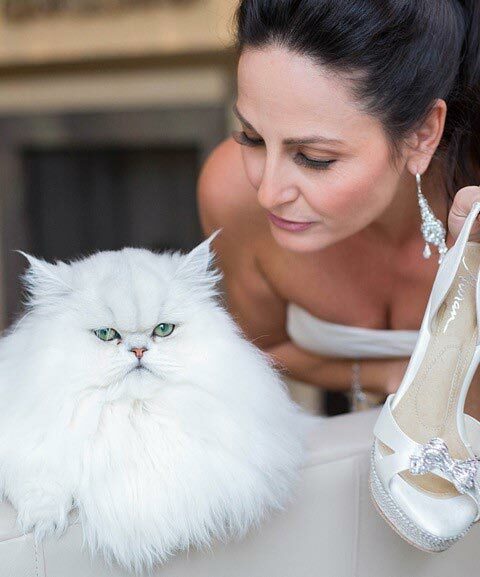 She followed her vision and overcame every obstacle to make Angela Nuran Shoes the “best kept secret in bridal” … shoes that brides dream of wearing on their wedding day. Shoes that faithfully carry every woman of every age through every important event. Comfortable footwear with dance shoe soles, high fashion style and luxury brand quality. The small strokes of genius that make these shoes so versatile are the icing on the cake. Offering comfort, custom fit, chic style, astonishing versatility and various heel heights in sizes 4 – 12, it is rare indeed for someone to not get what she needs from Angela Nuran Shoes. Handmade combining layers of plush padding, ultrasuede insoles, fine leather linings, and supple suede outsoles for uncommonly wearable, high quality shoes. Customer’s choice of jeweled brooch at the toe adjusts to a comfy width. Intriguing strap options change the look or improve the fit of a shoe. Off white silk uppers suit most brides, but any color is possible as these are dyeable shoes in the hands of our expert dyemasters. 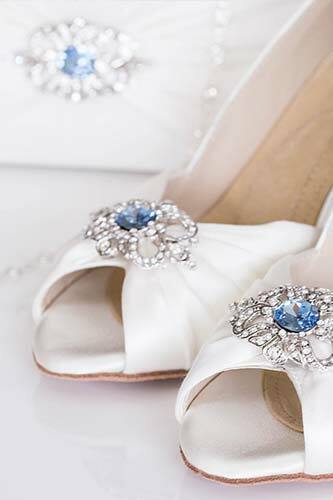 Lovely to wear as a comfortable shoe that beautifully complements a wedding dress or evening gown! Angela Nuran Shoes can be customized in so many ways! Choice of brooches or crystal beading for decoration. Dyeable silk for colour. Optional straps for styling or snugger fit. Adjustable width for comfort. Personal inscription to commemorate an affair. We deliver what is desired without compromising what is needed … comfortable shoes for any special event. Angela Nuran Shoes are chameleons with their own wardrobe of versatile shoe accessories. Brooches, shoe straps and ribbons are all removable and changeable on a whim. 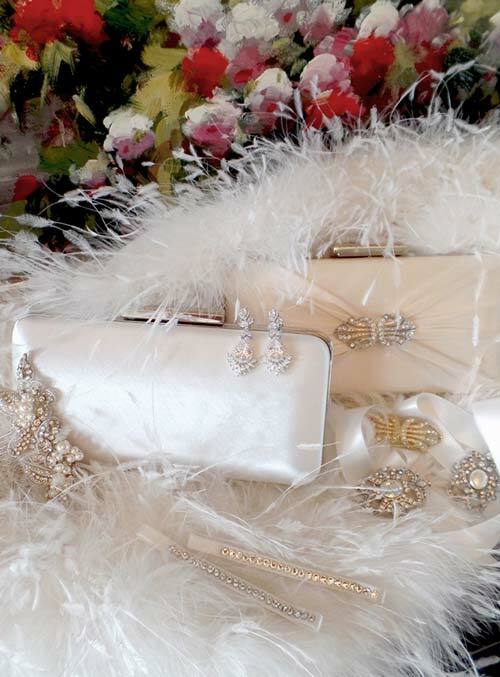 Our dyeable silk clutch in silver or gold is just the right size. 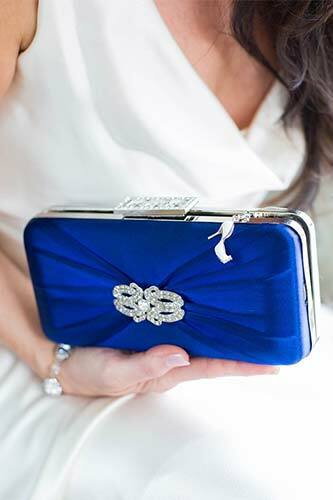 Think about adding a matching brooch on the purse. 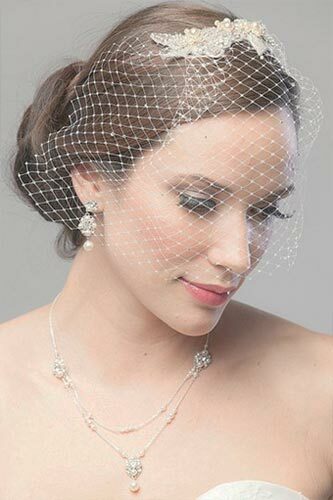 For bridal accessories, jewelry, veils, headpieces and sashes, our friend Laura Jayne has a beautiful selection. 1. Give you personal service, sometimes accompanied with champagne. 2. Show you the styles, brooches, dye charts and customization options. 3. Let you try on shoes to see how they feel and fit. 4. Answer your questions immediately or obtain the answers for you promptly. Did we mention you can actually try on shoes? There simply is no substitute for putting them on. 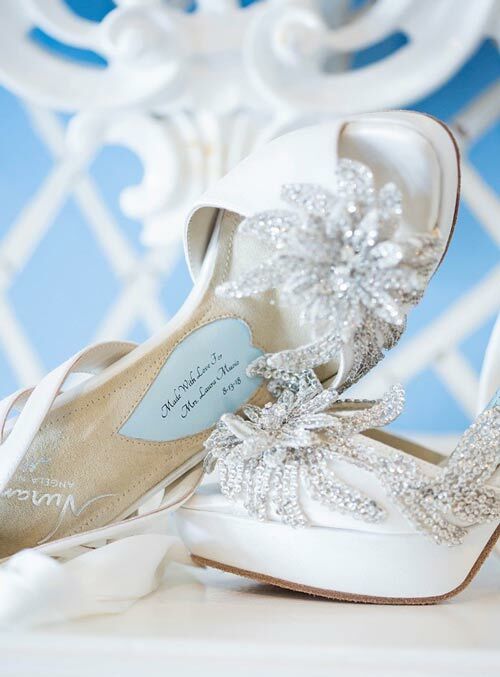 Once a woman slips her feet into Angela Nuran Shoes, she knows the search for bridal shoes or special occasion shoes is over. Calling the retail prior to a visit is suggested. Questions? Comments? Suggestions? Had a great experience or hit a snag with one of our retailers? Are you a retailer interested in representing our collection? Ask us why Angela Nuran Shoes are praised as the world’s most comfortable wedding shoes? Let us hear from you. Find more information on our Contact Us page.